By all accounts, Henri-Georges Clouzot was a prickly character, prone to being unpleasant and abusive towards the actors he worked with. This doesn’t seem surprising given the view of his fellow human beings which is displayed so forcefully in his films. By turns mean-spirited, insecure, selfish, confused and all too capable of violence, the characters who populate his work are deeply flawed, often unsympathetic … and yet all too recognizably human. Clouzot’s primary method is to put his characters under severe stress, a condition which breaks through the surface of socially constructed behaviour to reveal their complicated inner workings. From the poison pen letters which crack open the inhabitants of a complacent provincial town in Le Corbeau (1943) to the extreme physical trials faced by the desperate men in The Wages of Fear (1953), from the complicated, conflicted emotional relationships in Les Diaboliques (1955) to the elaborate patterns of deception and surveillance which break the protagonist of Les Espions (1957), Clouzot observes his characters with a chilly, clinical eye like a scientist initiating and dispassionately observing a chemical reaction. It is the peculiar tension between the emotional and psychological intensity of the dramatic content and the filmmaker’s detached perspective which gives Clouzot’s work its distinctive flavour. Not surprisingly, the complications of love and jealousy which offer a microcosm of revealing human behaviour drew Clouzot’s interest more than once – perhaps most spectacularly in the mad, unfinished experiment of Inferno (shot in 1964). But this theme was most fully, and successfully, explored in one of Clouzot’s finest films, La vérité (1960), which gave Brigitte Bardot her greatest role. 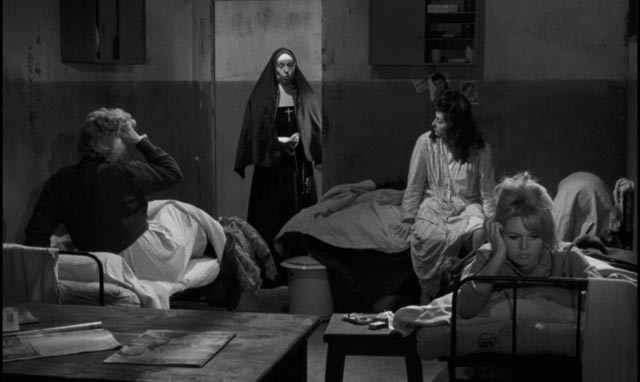 A courtroom drama with flashbacks, it begins austerely in a bleak prison as a nun makes her way up a staircase to a corridor where she unlocks the cell doors one by one, eventually coming to the cell where Dominique Marceau (Bardot) lies on her cot smoking. The nun reminds her that today she’s due in court to begin her trial for murder. 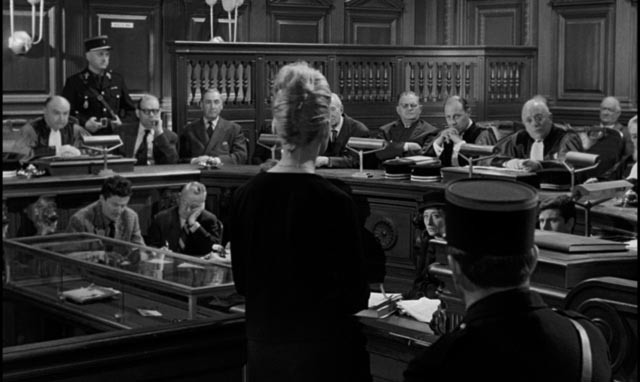 Before she arrives in the courtroom, an eager crowd of onlookers fills the seats and the opposing counsels greet each other amiably – Guerin (Charles Vanel) representing Dominique, Eparvier (Paul Meurisse) standing for the victim’s mother. Also opposing Dominique are the prosecutor (René Blancard) and the president of the court (Louis Seigner). Although there will be witnesses, much of the trial involves these four men sparring over details already spelled out in various statements obtained before the trial. The sheer weight of masculine authority arrayed against Dominique is crucial to the ostensible quest to uncover “the truth” of what happened. This, however, is not a conventional mystery. There is no question from the start that Dominique killed her lover, Gilbert Tellier (Sami Frey); what is in dispute is motive – cold-blooded murder; crime of passion; accident… As the various lawyers dig into the events leading up to the crime, we see step by step what occurred. And yet even given this seemingly objective account, uncertainty remains because even close observation of behaviour cannot reveal all the impulses which lie behind someone’s actions. Dominique, despite being provided for by her petit bourgeois provincial family, is restless and unhappy. She has no particular talents and has been overshadowed since earliest childhood by her sister Annie (Marie-José Nat), who has musical talent and is heading to study in Paris. After an apparent suicide attempt and with a promise to find work and make her own way, her parents reluctantly agree to let her go with Annie. The sisters share a cramped room while Annie studies music, but Dominique doesn’t find a job and her sister becomes increasingly resentful that Dominique contributes nothing. With no particular ambition, Dominique merely wants to enjoy life and she soon discovers a Bohemian cafe existence on the Left Bank, making friends with would-be artists and writers, who talk about projects they plan for the future while actually doing nothing much today. This suits Dominique perfectly. She’s pretty but shallow, always acting on impulse, casually promiscuous … everything the stuffy representatives of propriety in the courtroom fear and despise in the post-war young. Dominique and Annie have a final falling out when Annie’s fellow student Gilbert becomes obsessed with Dominique’s easy sexuality. She finds him a bit of a humourless prig, but he pursues her for weeks. Despite her apparent lack of interest, he also becomes jealous of her friends and casual lovers, and one night she sleeps with him out of anger … only to discover that she rather likes him after all. They become something of a couple, although she’s frustrated by both his possessiveness and his devotion to his studies to become a conductor, always putting work before her desire to have fun. Once she has become sexually involved with him, Gilbert quickly takes her for granted, paradoxically amplifying her own desire for him. This back and forth continues for some time, each provoking the other, erupting into angry outbursts, reconciling, only to fall back into frustration and resentment. Insisting that her unwillingness to give up her friends and her desire for social amusements to be with him – even though he’s often too busy to be with her – constitute a rebuke of his assertion of love, Gilbert makes a decisive break. It’s only after this that Dominique realizes how much she wants him, but it’s too late. She learns that he and Annie are to be married. She’s in a state of deep confusion when she visits him for the last time, carrying a gun with which she intends to kill herself in front of him. The mix of emotions and motives is impossible to parse into a simple formula, which is the purpose of the trial. The search for legal “truth” is really a way to reassert the social norms of which Dominique’s entire life has been a repudiation. The court – and the spectators and the reporters busily making notes during the procedure – has a deeply rooted structural need to condemn her. For them, the messy complications of human emotion are ultimately irrelevant. Dominique herself sums up the core of the tragedy when she says that she and Gilbert loved each other passionately, just not at the same time … an emotional truth which is of no consequence to the court. What matters is that behaviour must be contained within acceptable norms. For all the messiness of human behaviour on display, Clouzot the dispassionate observer exerts unwavering control over the dramatic structure of the film and creates scenes with such precision that his depiction of the conflict between youth and establishment seems like a deliberate rebuke of the loose, free-form Nouvelle Vague which was aggressively attacking traditional filmmaking in France at the time (Breathless was released seven months before La vérité). There’s nothing playful or ironic about Clouzot’s film, but it also avoids creating a pat, easily digestible emotional clarity. Rather, it shows that classical style is capable of greater richness and complexity than the new wave critics and filmmakers were willing to admit. Not surprisingly, Criterion’s Blu-ray provides a gorgeous image mastered from a 4K restoration by Sony and the Film Foundation. A pleasing degree of grain and rich contrast add to the film’s impact. The soundtrack is clean and uncluttered, with music limited to diegetic sources, giving the film a very modern feel. There are two short archival extras: a brief television interview with Clouzot from 1960 (4:41), in which he displays a slightly prickly response to the interviewer’s attempts to impose a pat interpretation on the director’s work; and an excerpt from a 1982 television documentary about Bardot (19:44), in which the actress talks about working on the film and the upheavals she was going through in her life at the time it was being made. The most substantial extra is Le Scandale Clouzot (2017, 1:02:35), an excellent documentary about the director’s career by Pierre-Henri Gibert, which covers his work from the Occupation – which caused problems in the post-war years – up through the ’60s, focusing on his often troubling interactions with actors, which took on sadomasochistic tendencies, and the perfectionism which became crippling by the time he started on Inferno. 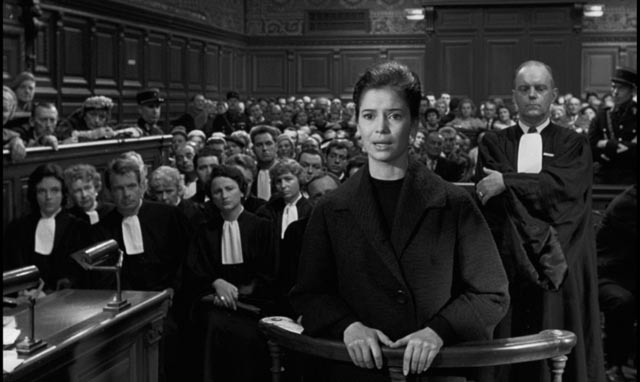 The booklet essay is by Ginette Vincendeau, who interprets the film more critically as an attack on female sexuality and autonomy, perceiving Clouzot as aligning himself with the masculine power represented by the officers of the court. This entry was posted in Review and tagged Actors, Blu-Ray, Crime, Criterion, Directors, French Film, Restored Films, Violence. Bookmark the permalink.